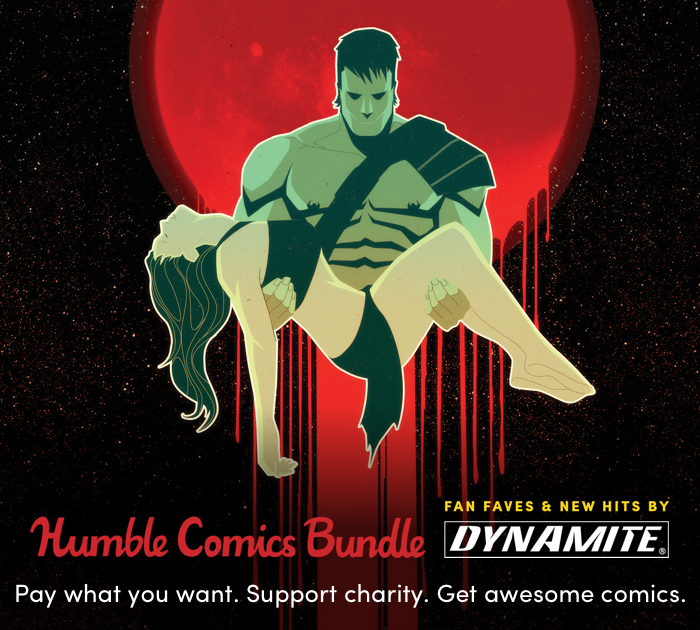 There’s only one week left to celebrate Dynamite’s 15th anniversary with the most epic Humble Bundle they’ve ever offered! Pay what you want for 330+ issues of comics, that’s nearly 10,000 pages of digital DRM-free comics you can download instantly and enjoy. The tiles range from fan favorites to the newest hits from Dynamite Comics, and everything you get supports Comic Book Legal Defense Fund in the fight for free expression! The bundle also offers fans a preview of the just around the corner releases of RED SONJA #1 from Mark Russell & Mirko Colak and ARMY OF DARKNESS / BUBBA HO-TEP from Scott Duvall & Vincenzo Federici. Comics included in this bundle feature the absolute greatest writers and artists of this modern era of comic books. The endless list of top tier talents includes Neil Gaiman, Grant Morrison, Kevin Smith, Mark Millar, Robert Kirkman, Alex Ross, Rick Remender, Gail Simone, Warren Ellis, Mark Waid, Garth Ennis, J. Michael Straczynski, Greg Pak, Kurt Busiek, Jim Starlin, Kelly Thompson and SO MANY MORE! Pay what you want. Altogether, these comics would cost $1274.21. Here at Humble Bundle, you choose the price and increase your contribution to upgrade your bundle! This bundle has a minimum $1 purchase.